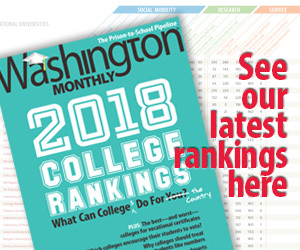 Washington Monthly | Roundup: Testing, Politics, Reauthorization — Oh, My! Roundup: Testing, Politics, Reauthorization — Oh, My! Sanders-scores-postal-union-endorsement CNN: The American Postal Workers Union announced their endorsement of Sanders Thursday, giving the insurgent Democratic candidate a small boost at a critical moment as his campaign tries to find its way. See also Bloomberg News. Massachusetts Chief Recommends Hybrid State/PARCC Testing Approach State EdWatch: Massachusetts’ education commissioner is recommending that students take a hybrid test in 2017 that would include material from both the state’s own test and the PARCC common-core-aligned assessment. See also Boston Learning Lab, AP. PARCC switches to a Chinese menu of standardized testing options Washington Post: Next year, states will be able to buy the entire Common Core test, or parts, or even just a few questions. See also EdWeek. Education researchers caution against using students’ test scores to evaluate teachers Washington Post: Many states are now evaluating teachers using a method that researchers are calling questionable. Sources: House and Senate Negotiators Have Reached Preliminary ESEA Deal PK12: Christmas seems to have came early this year for education advocates. After weeks of long and hard negotiations, House and Senate lawmakers have reached preliminary agreement on a bill to reauthorize the very long-stalled No Child Left Behind Act, multiple sources say. Broad Foundation defends charter plan after concerns about public school impact KPCC: “We’ve got over 50,000 students on wait lists in charters. Why is that? It’s because parents want different choices, they want something different,” Broad’s Gregory McGinity said, speaking publicly on the plan for the first time since it was leaked in September. See also LA Times. De Blasio Holds Town Hall in One of City’s Most Overcrowded School Districts WNYC: With the town hall located in school district 30, one of the city’s most overcrowded areas, parents asked for better planning when it came to school space and expressed a yearning for smaller class sizes.